We went out with some friends for cheap Conveyor Belt sushi tonight! How cute is Sean in this picture? 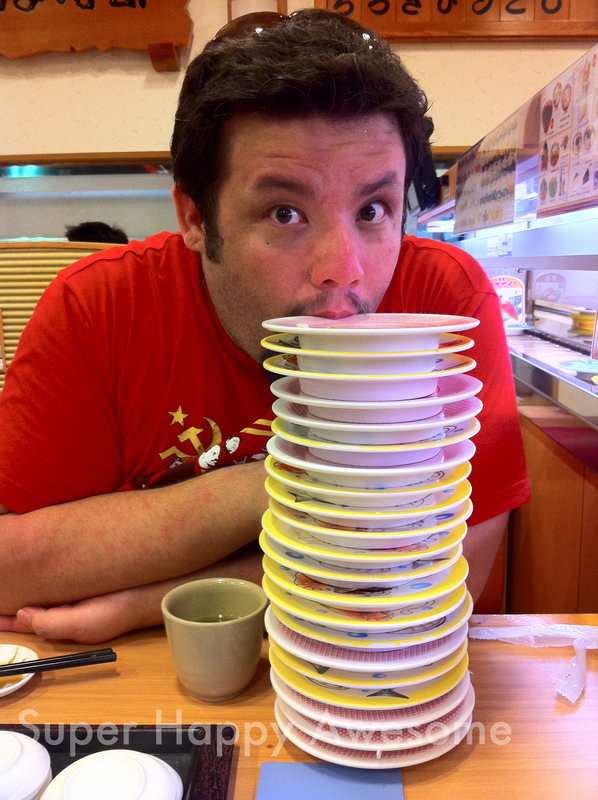 He didn’t eat all of those himself though–that’s actually both of our plates together. And at ¥105 a plate, it still only set us back about $20! My favorite dish of the night was the beef sushi. Beef sushi may not sound like the best idea, but this was actually pretty tasty. It was a bit like roast beef with a teriyaki glaze, and it belonged to that small subsect of “cooked” sushi. It’s not all raw! It’s not even all fish! They even had a Hot Dog sushi, but I didn’t get a chance to snag one. Also, the thought is slightly revolting. What’s the weirdest sushi you’ve ever tried? 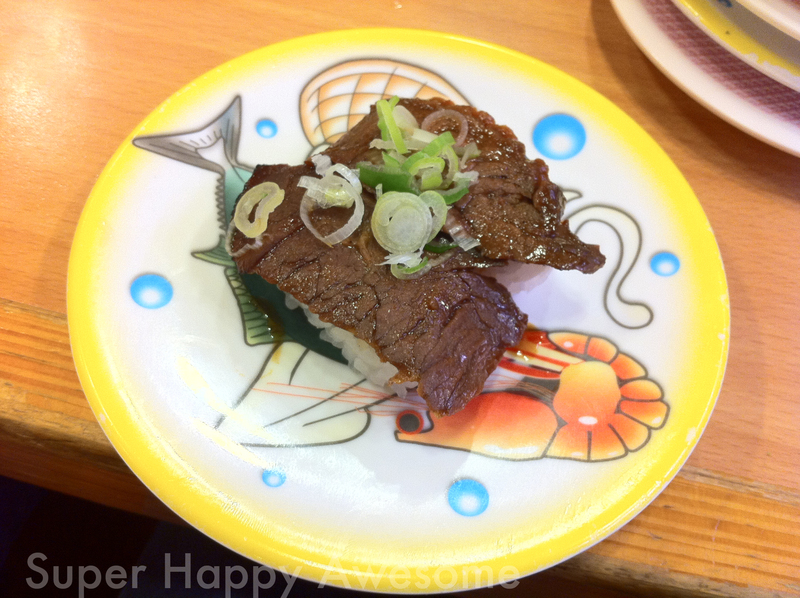 This entry was posted in Food!, Japan and tagged beef, sean, sushi, tasty, yummy. Bookmark the permalink. 8 Responses to Beef Sushi? Weirdest sushi I have tried was horse sushi (yes, it was raw). Strange sushi? Don’t think I’ve had any…though I have had the beef sushi. That’s quite good. Unfortunately, I won’t be going out for sushi much at all over the next few months while my fiancee is pregnant. She can’t eat raw fish! Not really sure if I find that so I unusual. I’ve certainly had stuff billed as beef sashimi before which was essential lightly seared beef on the outside, but raw in the center, and and thinly sliced. The Sides of should and wasabi. I have to say, it might have been fusion, but it was certainly good. Wierdiest sushi ever? Raw chicken. Oh dear God it was delicious. It wasn’t entirely raw, one side was slightly cooked and it had a sort of gradient of cookedness going across it. Totally wasn’t expecting it to taste very good, but they were tasty morsels of chickeny goodness. One sushi I’m not fond of has these little white translucent baby fish with black eyes. Too much of an aftertaste. I just can’t move past foods with strong aftertaste. This, natto, liver, and grapefruit. It’s just not my thing. Sounds (and looks) good actually.